Our event highlight was the number of test drives we gave. We think providing a first-hand, electric experience is the best way to educate people about the performance and practicality of the many models available. Last year we gave 200 test drives, and this year we gave 120. National Drive Electric Week (NDEW) is a national opportunity for the general public to interact with the rapidly changing and advancing vehicle market, where most major auto manufacturers have contributed to the 20 plug-in models on the market today. Driving electric is different - quiet, fast, and technologically advanced, there is a lot to learn about electric vehicles. NDEW provides people with the opportunity for interact directly with multiple electric models, get questions answered from the industry and from EV owners, and determine whether it's time to consider driving electric. 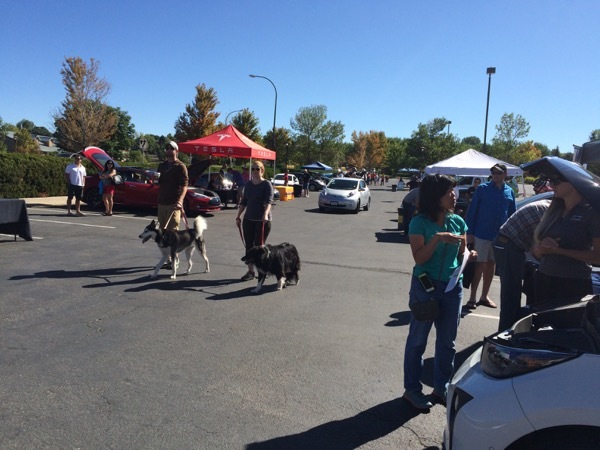 Our NDEW events have consistently been some of the largest events in the country, and the largest event in Colorado. Come out and enjoy yourself at Aspen Grove mall and learn something new! 1) EV Ride & Drive - Drive any of the electric models you like. We will have a Tesla Model S, Nissan Leaf, BMW i3, Chevrolet Volt, and Porsche e-hybrids available for you to get behind the wheel of! Attendees ages 18 or older will be able to drive any or all of the plug-in models available after signing a liability waiver. Driving electric is thrilling and surprising due to the instant power of an electric motor, and through the hundreds of test drives we've given in the past, even skeptics are turned into believers after driving a car like the BMW i3. After the drive, we ask you to complete a brief survey about your experience. 2) Vendor Exhibition - Local businesses (utilities, solar companies, etc. ), government representatives, and other knowledgeable people will share their expertise about electric vehicles. This is your opportunity to get your questions answered about charging options, emissions, costs, benefits, and incentives. 3) EV Owners Showcase - Hear from EV owners themselves about what it's like to drive one, how much it really costs (it's cheaper than you think), where to charge the battery, and more! Registered attendees report 482,480 electric miles driven.